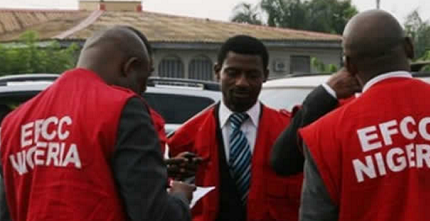 EFCC arraigns A’Ibom rep for certificate forgery – Royal Times of Nigeria. The Economic and Financial Crimes Commission, EFCC has arraigned a serving member of the House of Representatives, Nse Ekpenyong representing Oron Federal Constituency of Akwa- Ibom State in the National Assembly before Justice Ijeoma Ojukwu of the Federal High Court sitting in Uyo, Akwa Ibom State. The EFCC in a statement by its spokesman, Mr. Wilson Uwujaren said that Ekpenyong was arraigned on nine counts bordering on forgery. Ekpenyong was alleged to have forged an Abia State Polytechnic Ordinary National Diploma Certificate and uttered a December 1999 West African Senior School Certificate and thereby committed perjury before an Electoral Tribunal where he claimed that the certificates were genuine. One of the charges read, “That you Nse Bassey Ekpeyong on or about the 22nd November, 2012 at Uyo within the jurisdiction of this honourable court did make a document to wit: Abia State Polytechnic National Diploma Certificate in Business Administration with Certificate No. 001181 dated 22nd November, 2012 with intent that it may be acted upon as genuine which you knew to be false and thereby committed an offence contrary to Section 1 (2) (c) of the Miscellaneous Offences Act CAP M 17 of the Revised Edition (Laws Of the Federation of Nigeria) 2007 and punishable under Section 1 (2) of the same Act. Another count read, “That you, Nse Bassey Ekpeyong, on or about the 18th December, 2014 at the INEC headquarters, Abuja within the jurisdiction of this honourable court did utter a document to wit: West African Senior School Certificate No. NGWASSCP 557610 with intent that it may be acted upon as genuine which you knew to be false and thereby committed an offence contrary to Section 1 (2) (c) of the Miscellaneous Offences Act CAP M 17 of the Revised Edition (Laws Of the Federation of Nigeria) 2007 and punishable under Section 1 (2) of the same Act”. The defendant however pleaded not guilty to the charges when they were read to him. In view of his plea, prosecution counsel, Ahmed Arogha and S. Hussaini, asked for a trial date and accelerated hearing of the matter. However, the counsel for the defendant, Emmanuel Isangidoho, told the court that he had filed an application for bail for his client and urged the court to admit him to bail. Justice Ojukwu granted the defendant bail in the sum of N10m with one surety in like sum. The surety must depose to an affidavit of means, provide two recent photographs and a three-year tax clearance certificate. The judge ordered the surety to write an undertaken to produce the defendant throughout the trial and all the documents of the surety must be verified by the court registrar.